In this project we will discuss about Home Security Alarm Using PIR Sensor & Arduino for Night time only. A night security light only turns on when it’s dark and when movement is detected. The lamp & the buzzer turns on when it’s dark & movement is detected. When there’s light, the lamp is turned off, even when motion is detected. Assemble the circuit as shown in the figure below. PIR sensors are more complicated than many of the other sensors explained in these tutorials (like photocells, FSRs and tilt switches) because there are multiple variables that affect the sensors input and output. The PIR sensor itself has two slots in it, each slot is made of a special material that is sensitive to IR. The lens used here is not really doing much and so we see that the two slots can ‘see’ out past some distance (basically the sensitivity of the sensor). When the sensor is idle, both slots detect the same amount of IR, the ambient amount radiated from the room or walls or outdoors. When a warm body like a human or animal passes by, it first intercepts one half of the PIR sensor, which causes a positive differential change between the two halves. When the warm body leaves the sensing area, the reverse happens, whereby the sensor generates a negative differential change. These change pulses are what is detected. The circuit is infact a dark activated switch that measures the ambient light level and will enable the system only when ambient light level is below a threshold value. Here an LDR (Light Dependent Resistor) is used to measure the light level. The alarm system is triggered when a “Logic High (H)” level signal is detected at its sensor input port. when it detects a moving target. 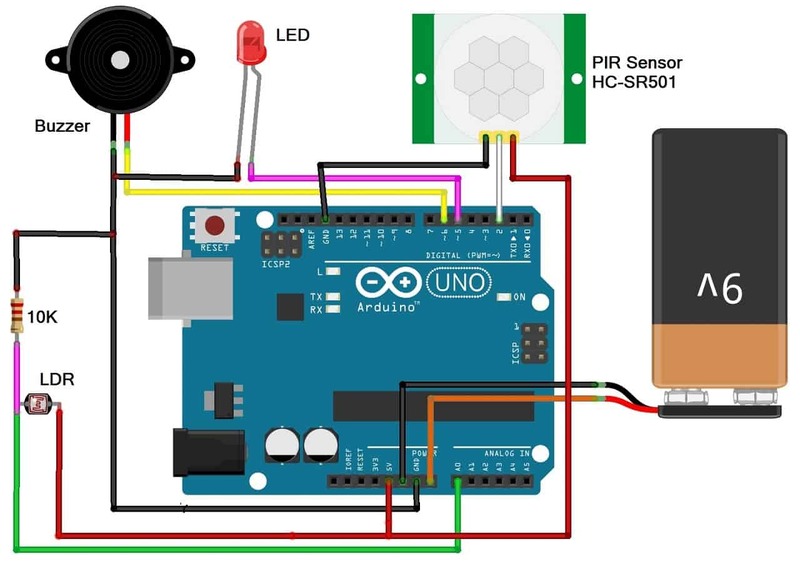 The code for Home Security Alarm Using PIR Sensor & Arduino for Night is given below. Copy the code and paste it to your Arduino IDE and then compile & finally upload it to the Arduino Board.